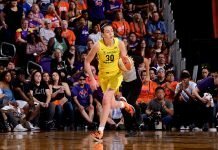 Los Angeles, Calif. – The Los Angeles Sparks dominated the Minnesota Lynx Tuesday night in what has turned into a home court advantage series between the two teams this season. Candace Parker put up 27 points in 26 minutes to lead the Sparks, while Kristi Toliver added 14 points and nine assists, and Nneka Ogwumike had 12 points and 10 rebounds in the 96-66 win. It was the third time in 12 days that Los Angeles and Minnesota had played each other, with the Sparks doing the first drubbing at Staples Center and the Lynx returning the favor last Friday on their own home court. Coaches of both teams expressed surprise at the results of the third match up. The Sparks and Lynx battled for the Western Conference championship last year. Reeve said it is an understatement to say that home court advantage has become a huge part of the rivalry between the two teams this season. Parker got off to a hot start in the first quarter with 13 points, which included three three-point shots. The second quarter turned into a team affair for Los Angeles, as Parker added eight more points, and bench players Marissa Coleman, Jantel Lavender and Ebony Hoffman added to the scoring total. The Sparks lead 60-39 at halftime, on 59.5 percent shooting. The hosts opened the second half on a 10-4 run, punctuated by a Parker no-look pass to Ogwumike for a layup, which put them up by 27 points. The pace slowed in the fourth period, as all Sparks starters sat out and the bench pushed the lead to 32 in the final minute. Lindsay Whalen lead the Lynx with 19 points, and Rebekkah Brunson added 18 points and 12 rebounds. Reeve said the second quarter was especially problematic for the Lynx. “We didn’t respond well from their run there in the second quarter. We kind of let the wheels fall off for us as a team and it just kind of got away from us there,” she said. “As far as the other two games, kind of been a similar pattern for the home teams coming off playing really well. I don’t really know why. I don’t know if I can really tell you why. The Sparks are now 6-4 and without a home victory – the only team in the WNBA that hasn’t won on the road this season. Ross doesn’t pretend to understand it. The series will take a long break now, as the two teams don’t face off again until September.